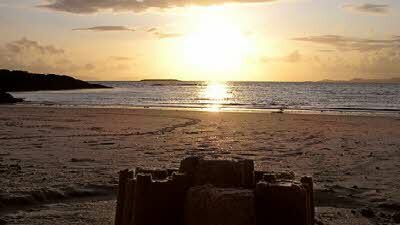 Overlooking Traigh Bay and Traigh Golf Course this CL is only a step from our beautiful white sandy beaches, perfect for relaxing, whether it's just admiring our charming bay, paddling in rockpools or taking a stroll looking for shells. For those more energetic it's an ideal spot for messing about in boats, many guests bring their dinghies and kayaks, many a mackerel has been caught and then cooked over a barbeque! Facilities- Water, bins and septic tank on site. We can charge your battery. No electric hook-up or toilets. Wildlife - herons and owls nest in the wood behind, otters are often seen playing and feeding in the bay in front of the caravans. 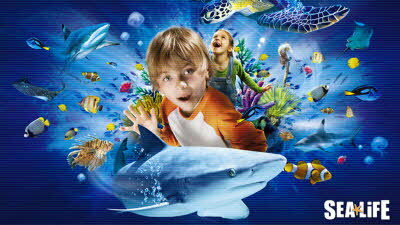 The area has a vast range of sealife. Whales, dolphins and basking sharks are commonly seen. Birdlife is extensive including Sea Eagles. 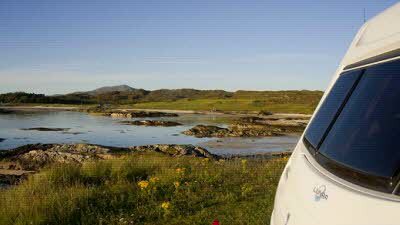 Golfers - CL adjoins our very own 9 hole Traigh Golf Course. Walkers - local walks including Ranger guided walks. 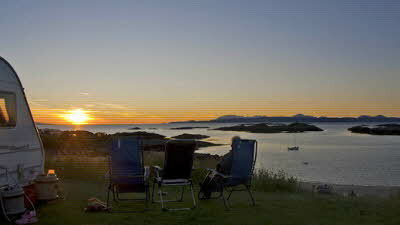 Arisaig - don't miss the award-winning Land, Sea and Islands Centre. Displays include information about local crofting, fishing, church history, marine life, nature, archaeology, Bonnie Prince Charlie, and those who trained in the area for the Special Operations Executive (SOE) during World War II. Local tourist information and WiFi access is available. Mallaig - The Visitor Information Centre: Mallaig Heritage Centre: Mallaig Swimming Pool: the Jacobite steam train operates in the summer from Fort William to Mallaig. Morar - Ginger sells knitwear and clothes which are designed and crafted by Anna Skea, in the workshop, using colour and texture in a distinctive way. Boat Trips and Watersports- Many operators offer boat trips to the Small Isles, Skye, Knoydart and on Loch Shiel near Glenfinnan. 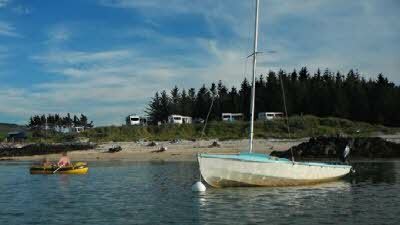 Sea Kayaking and boat charter are available locally. 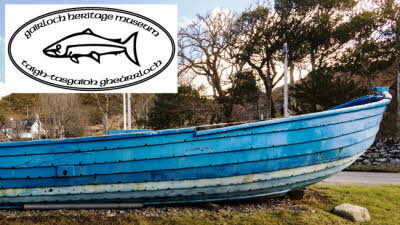 Fishing, charters and boat trips can be arranged on Loch Morar. Booking is essential in the summer months. 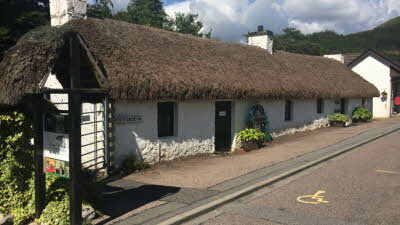 The museum takes you on a journey through time showing how local people lived and worked in Gairloch through the ages. Find out more about the area with working models, quizzes and hands-on activities. Changing exhibitions, regular special events and activities. Haven't left a review until now as I just realised how much I talk about this wee site but hadn't left a review. We have stayed twice so far on this CL First time in 2017 a chance stopover en-route to the Skye ferry. 2018 we planned a route in order to stay four nights. Location is just heaven on earth, the views of the islands are awesome, the wild life amazing, right on a white sand beach so dogs love it, ideal for a canoe, a wee dinghy or just messing about in the shallows. It is within a seven iron shot of the first tee on Traigh 9 hole golf course. 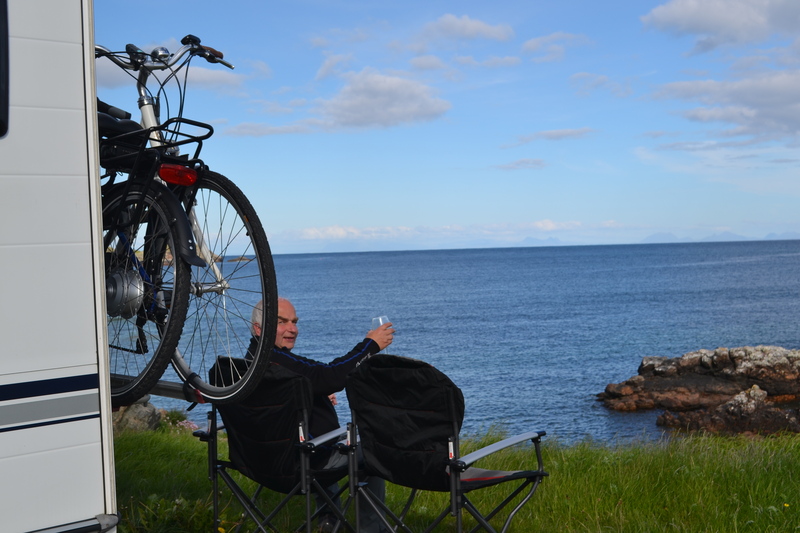 Cycle (we have assisted bikes) into Arisaig for supplies, a nice meal or a bit of impromptu music in the hotel. Walking to Morar sands along the shore is doable if you watch the tide. Yes it is a sloping field (but it is huge for 5 vans) No it doesn't have electric hook up and yes you have to bring your own toilet & shower. AND yes we are just about to head off soon to stay a for a few nights out of season (hope we can get in). Dream location...what more could you want! We love this CL, the views are stunning and the white sandy beaches are great. Our dogs loved it too. It is a basic site but that adds to its charm for us. It's the 2nd time we have been here and we will definitely return. 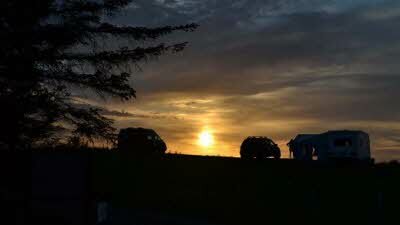 If you don't mind basic camping then you will not be disappointed. Sit back, relax and enjoy the views....brilliant! Apart from the fantastic view, we found this site a little disappointing. 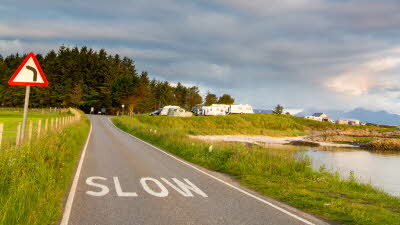 It is basically a sloping field which large motorhomes may have difficulty driving onto a level pitch after rain. The arrangements for paying are that you have to visit the owner's house which is about a mile from the site which isn't great if you're in a motorhome. The house itself has no signage to indicate that it is the correct one. I spent so much time talking about the view in my last review I forgot the beach. 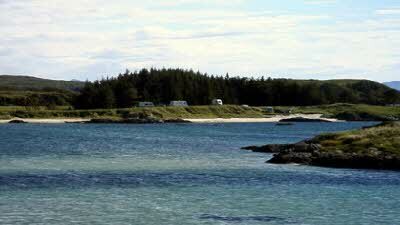 Golden sand, almost white in patches, outcrops of rocks, many of which form small islands when the tide comes in. Loads of different shells. The beach goes right round the bay. The bay is only 300 metres wide so is small, sheltered, and very safe. Ideal for children. We first visited this CL when the kids were small. They are now in their late teens but we still go there. I don’t know why more families don’t visit – the beach will keep the kids occupied for hours. We take a kayak and floaties. The water is clear and you can see fish and crabs. On the surface you see loads of birds. We once saw a seal and one September a basking shark. Water is cold – even in summer. CL is on grassy bank about 2 metres above the beach. Easy climb down from the pitches nearer the road. Pitches nearer the road are level so suitable for campervans. All pitches have a view. 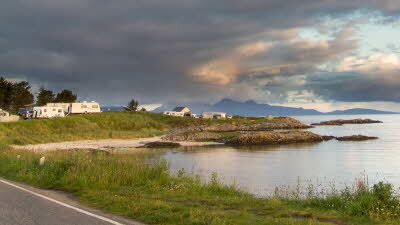 Those further from the road look more round towards Eigg. Road is quiet.